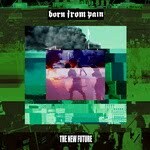 Born From Pain streams entire 'The New Future'. Pre-order packages available! Groove, riffs, melody and defiance to the powers that be come into one - this is how GSR Records describes new album by Born From Pain. The label offers 3 different pre-order packages. More about the album: "This is the musical reaction to creeping oppression, anti-human policy and fear mongering by the powerful few of this world against the people. This is a cry for the better and new future we all deserve. This is the result of a 15-year journey of a band coming to full awareness of the world around them and daring to stand up for their beliefs, musically coming of age with more melody, hardness and atmosphere than ever before. Fear won’t stop us in our tracks…THIS IS US!" You can listen to the entire album here.